We were a little late for check-in and Amy already had our cabin warming up for us. We got to meet their adorable dogs and any questions we had were easily answered for us. We also requested a late check out so we could explore the surrounding area. It was just all-around awesome! Friendliest people you will ever meet. They have a true love for the property and guests. It's a passion for what they do. We travel a lot and have never encountered owners that are so passionate about what they do. The excitement they show about future expansion and upgrades makes you smile. Love the property!!!! View is out of this world!! Property is in good shape with the owners making constant upgrades. Amy Klass was super friendly and kind. Super helpful, attentive if need be and makes you feel welcome right from arrival. Not only was the view from the cabin completely ambient. The place has absolutely everything. Plus, for how many people could sleep in our cabin comfortably it's a really good deal price wise. Super spacious, clean and there is not one thing I needed in the kitchen especially, that wasn't already there. Not to mention I do not like wine, but the bottle of wine left for us was actually amazing. I never thought I'd say that. I brought my hammock to set up only to realize my balcony already had a hammock set up. I would highly recommend this place to anyone who loves the outdoors and is a homebody as well. I will certainly stay here from now on every time I go to eureka. It was the most perfect place for us to bring in the New Years! Our stay was gifted to us from friends who had stayed previously. They loved it so much they wanted to give as a gifted. All we had to do was call to make reservations which was done with such ease. Upon our arrival, management was already waiting on us with porch light on and cabin warm and cozy. We were completely thrilled with our stay. We requested a late checkout and were granted with no problems. We will return and have recommended to many. Such a gem and beautiful setting. We plan to return as often as we can. Beautiful setting, gorgeous views and exceptionally clean cabins fully equipped with all needs. We loved the balcony views overlooking the white river and sunset. We used the firewood and fireplace to complete our stay. Such a short, quick drive into Eureka. Loved our stay! Owners of cabins are awesome. Thank you. Our stay was very enjoyable. Would have been better if you could get to river near the cabins. The Cliffside cabin was absolutely fantastic! They had everything from A to Z with all kitchen, bathroom, bedding supplies. The scenery was outstanding! Very cozy, romantic getaway with an affordable tag. I would highly recommend this beautiful cabin if its a romantic getaway! The owners were super sweet. Thank you for an unforgettable getaway, we will always remember it and we are looking forward to the next stay there! When we checked in, Amy was very helpful and gave us a list of restaurants. We tried one, and it was excellent! The property was peaceful, and we had a beautiful view from our deck. Amy was very helpful with the reservation, and describing our cabin options. We arrived after dark and Art met us outside our cabin with the key. The cabin is cozy, well-furnished, with the comforts of home plus an outstanding view!!! We had a wonderful time on the river and in Eureka. Just what we needed to unwind! Thank you so much Art & Amy!!! It was awesome! We'll stay there again soon. New owners are friendly and helpful. Easy to work with and prompt responding to any questions about the reservation. Glad to see the property being updated and maintained properly. Can't wait to see the changes they make in the future. Amy had us checked in very quickly and gave us all the information we needed to have a relaxing stay. We have stayed at the Arkansas White River Cabins several times in the past. The changes and updates to the rooms and property were very nice. We have stayed at places that were not as clean and affordable as the Arkansas White River Cabins. Art and Amy were immediately available every time we needed to talk to them, and always helpful. Our stay was completely enjoyable, and trouble-free (except for our own tech-ignorance, which Art and Amy helped us with). Art and Amy were knowledgeable about local sites when we wanted to venture into town: but we were glad we had this quiet, cozy retreat outside of town. 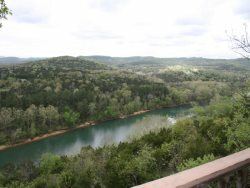 We enjoyed relaxing and taking our coffee on the porch, with its beautiful Ozark vista, as much as any of the local attractions we visited. Art and Amy are doing a great job. They are dedicated to making the stay at Arkansas White River Cabins excellent in every way. My wife and I had a most enjoyable get-away at the Cliffside Cabin overlooking the White River. The amenities were excellent as was the location and scenery. The Cliffside Cabin has been recently refurbished with new furniture including the comfortable bed that has a skylight above it. You can tell Art and Amy take great pride in their business. We look forward to returning and seeing the many other improvements planned for future. If your looking for a cabin in the woods get-away we would highly recommend this property. Quick, friendly check-in and check-out. I've never had a check-in go faster, actually. Everything excellent. Only minor comments would be that the cabin had a stale smell upon entrance - perhaps a little room deodorizer would remedy that. Also noticed that the outside light at the door at the top of the stairs was burnt out. Beyond that, awesome!! Comfortable, clean, relaxing. What more could you ask for? Loved kicking back on deck with the view of the river and valley. With two couples splitting the bill, an outstanding value for Eureka Springs trip. Highly recommended! We were able to visit the cabins a few weeks before our actual stay. Art and Amy were so nice to let us see the exact cabin we rented, even though Amy was cleaning it for the next guests. She never hesitated to stop what she was doing and give us a quick overview of the cabin and give us all the information we needed to be prepared for our stay. Art took the time to give us a tour of the grounds, and explained everything in great detail. They definitely went above and beyond to make sure we felt comfortable! It was an absolute wonderful experience! Art and Amy truly thought of everything to make our weekend stay all we dreamed of! The cabin was warm, relaxing and very romantic! The view from the back deck was incredible which enhanced the entire experience. We definitely plan on coming back as we have now found our secret romantic getaway location. The owners were very friendly and easy to deal with. Very cozy and inviting cabins! Very well stocked for all of your cooking needs. The decks are great and have some of the best views in the area. The cabin was fantastic. Very clean, well stocked and super cozy and let's not forget about the views! They are million dollar views. Waking up early and watching the fog roll up the White River was stunning. No issues whatsoever, very helpful. We visited for our anniversary and it was so, so wonderful. The property was immaculately clean and well-kept, the owners were helpful and responsive, and the views were breathtaking. Pictures cannot capture how beautiful it was. The property was so quiet and peaceful, while still close to enough shops, restaurants, and attractions to keep us busy and entertained all week. The cabin was very well stocked with dishes, towels, extra blankets, and everything else we needed. It was as perfect as I could have possibly hoped, a wonderful retreat into nature but with all the comforts of home. The only thing more I could've wanted was a bathtub and not just a shower in the unit we stayed in. Thank you for such a great experience, I will absolutely recommend this place. Art was very helpful and friendly. Very clean and everything you need is there.